2. Season the steak with salt and pepper. 5. While the steak is resting, place the rocket leaves in a bowl. 6. Cut the cherry tomatoes in half and add them to the bowl of rocket leaves. 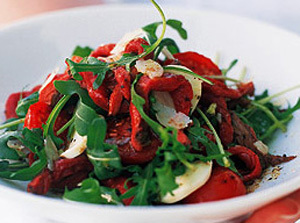 Dressing: Throw the oil that is left over in the pan Add fresh olive oil, 2 sprigs of rosemary, 2 crushed cloves of garlic, lemon zest of half a lemon, juice of half a lemon\ Infuse in a warm pan for 5 – 10 minutes Slice the steak, place on top of the rocket leaves and cherry tomato mixture Drizzle the dressing on top.